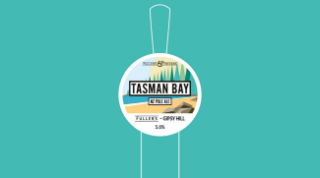 After the success of the Fuller’s & Friends series last year, Fuller’s have teamed up with their friends at Gipsy Hill to create another beer to add the series; Tasman Bay. The Gipsy Hill brewers came to Fuller’s to create this pale ale in another collaboration. Both Motueka and Nelson Sauvin hops, used in the brew, are grown very close to Tasman Bay on New Zealand’s South Island. They contribute to the beer’s peach, grapefruit, lime and papaya flavours. This is a hop-forward, fruity beer inspired by the Southern Hemisphere. Tasman Bay is located in the South Island of New Zealand. It is famed for its vast beaches and blue shores. In fact, this is actually the second beer brewed with Gipsy Hill. The first was “Doyen” – a 6.5% IPA brewed at Gipsy Hill with Head Brewer George Young in South London, which used Fuller’s yeast to add a unique flavour. Fuller’s have teamed up with their friends at Gipsy Hill to create another beer to add the series.